Hilly Fields Park was formerly farmland known as Park Farm. In 1909, despite considerable local residents and builders opposition, the farm was purchased by the Enfield Council at a cost of £8k. saving the land from exploitation by developers following the opening of the new railway stations at Gordon Hill and Crews Hill. Incredible as it seems the Council’s decision to purchase was carried by a majority of only one on the nine eligible votes! By 1920 the Park had become a very popular recreation area. In the early 1920’s due to the growing popularity of Brass Bands, the Council, at a cost of £400, built the Bandstand. In this period entertainment at the Bandstand attracted very large audiences reaching over 5,000 on some occasions. Although still widely popular, audiences fell to much lower levels in the 1930’s due to competition from cinema, radio and other forms of entertainment and in the 1940’s world conflict, Bandstand entertainment was not promoted at all. Some revival began in 1950’s with entertainment being promoted largely for school children during their long summer holiday, however by the late 1970’s the Bandstand again fell into disuse. Left to disrepair, dereliction reached such a level that in 1997 the Council decided that the structure should be demolished. Faced with the prospect of the permanent loss of the Bandstand local people were stirred into action. A group was formed who collected some 3000 signatories to a petition to the Council to save the Bandstand. The Council agreed to forestall the demolition on the understanding that the group would themselves raise the finance required to restore the Bandstand. 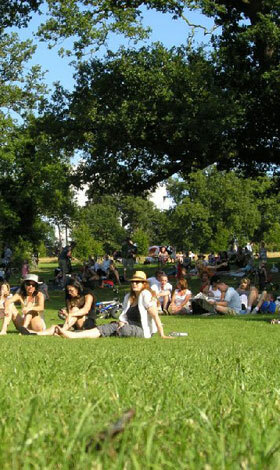 In 1998 the group was formally established as the “Friends of Hilly Fields”. Following formation, the “Friends” with the help and support of residents and sponsorship by some local firms, raised funds to promote concerts and entertainment on a regular basis at the Bandstand site. During 1999 plans were developed to restore the Bandstand. In the millennium year the “Friends” were successful in obtaining a grant from the Heritage Lottery Fund of some £60k. for the Bandstand restoration project . The restoration was completed in 2001, with its first formal concert in September of thatyear. Also in 2001 the “Friends” secured a 25-year lease on the Bandstand from Enfield Council and were granted charitable status by the Charity Commission. The “Friends” are an entirely voluntary and non profit making association supported by Enfield residents, sponsorship and public donations. Concerts and Fun events are organised around the Bandstand on a regular basis. However as the concerts are free we ask you to donate generously to the local nominated charity at each event.